It Cosmetics Bye Bye Redness Neutralizing Correcting Cream .37oz NIB PICK SHADE! morris1968 has no other items for sale. 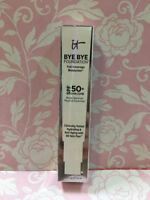 Details about It Cosmetics Bye Bye Redness Neutralizing Correcting Cream .37oz NIB PICK SHADE! MAC Mariah Carey LIM.EDIT. Extra Dimension Skinfinish "MY MIMI" AUTHENTIC & NIB!